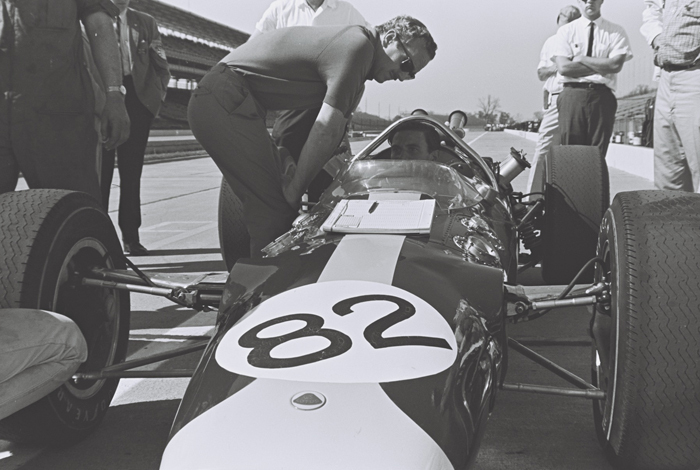 First things first: Andrew Ferguson, Team Manager, was corralled by Colin Chapman at the beginning of May to paint the number “82” on the nose of Lotus 38/1. 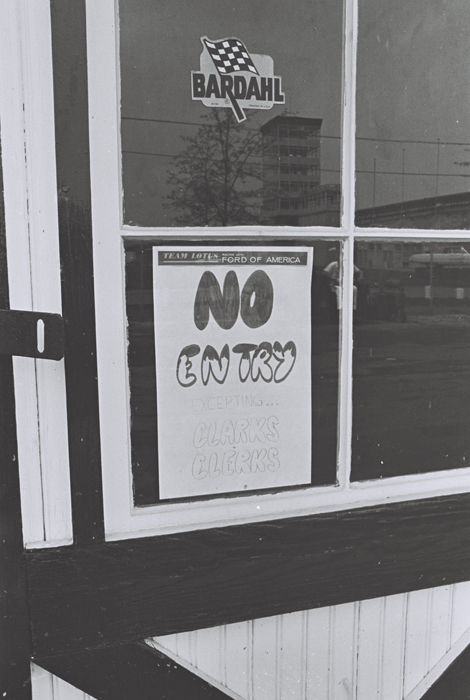 This was the result: Very quickly, Colin employed the services of an Indy professional signwriter (George Gruber). The result, complete with serifs, was artistic magic. Andrew (pictured below right in the background, in dark polo shirt) later recalled the incident in his excellent autobiography. Indianapolis became a steep learning-curve as the month of May gathered pace. 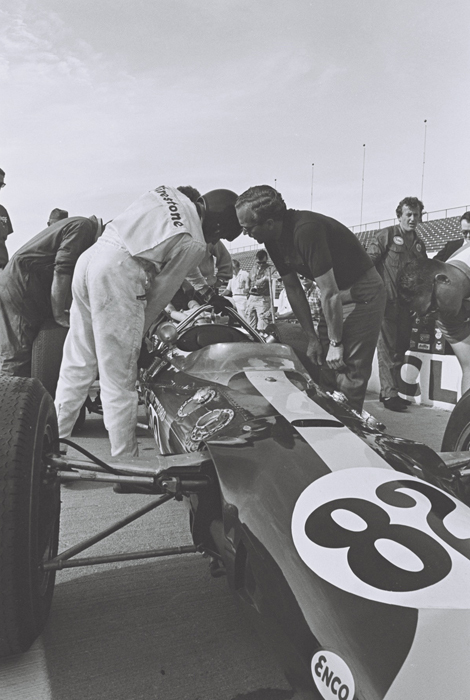 As well as embracing the ways of the idiosyncratic Speedway, and all that comes with it, Team Lotus faced the additional problems of being newcomers amongst the old guard, of initiating the winds of profound technical change and of trying many all-new components thus related. Like big, aluminium, 4.2 litre Ford Fairlane V8 engines. And Firestone tyres. And Halibrand wheels. And asymmetric suspension. And seat belts. And, yes, Bell Magnum helmets. 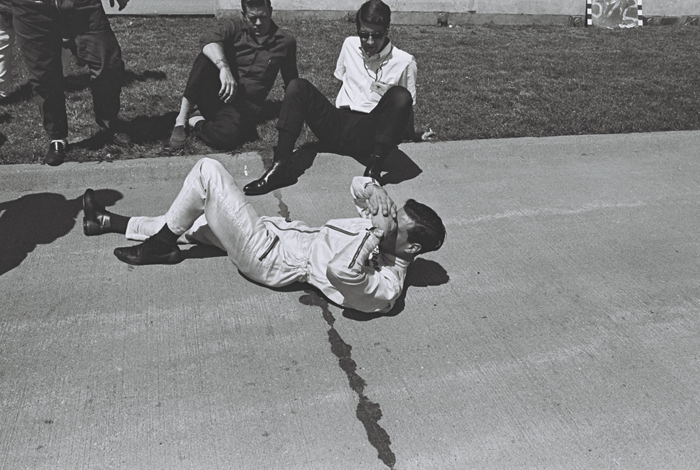 For most of the month of May, Jim, Colin Chapman and David Phipps, the talented photo-journalist, stayed in the house of Rodger Ward, the 1959 and 1962 Indy winner. 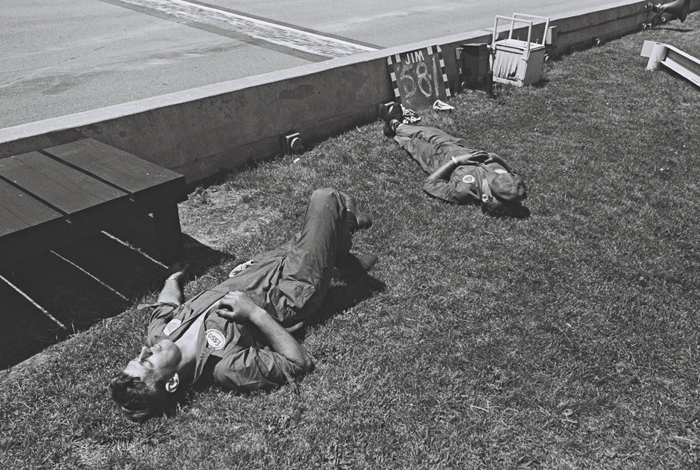 The days were relaxed by European racing standards, beginning with early morning tests, lunch work, more afternoon laps and then late-ish nights with the mechanics after early evening meals. 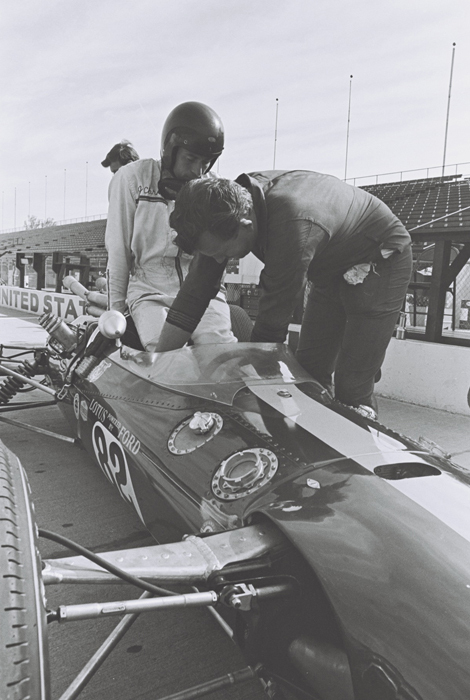 The issues were many: the Dunlop D12s were quicker (Dan Gurney had lapped his Lotus 29 at 150mph while Jim was racing in Europe) but the Firestones were more durable. With one pit stop to the roadsters’ two or three, Lotus could enjoy a big advantage even before the race was underway. To achieve that, however, they needed to run the less grippy Firestones. This, in turn, caused a furore. 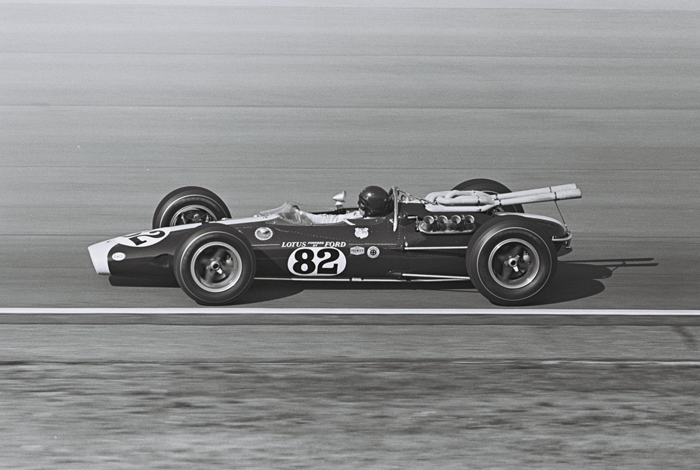 Firestone built special tyres for Lotus around 15in wheels but then quickly found themselves under pressure from the Americans, who also expected the same, larger, footprint tyres for their roadsters (which normally ran 18in wheels). 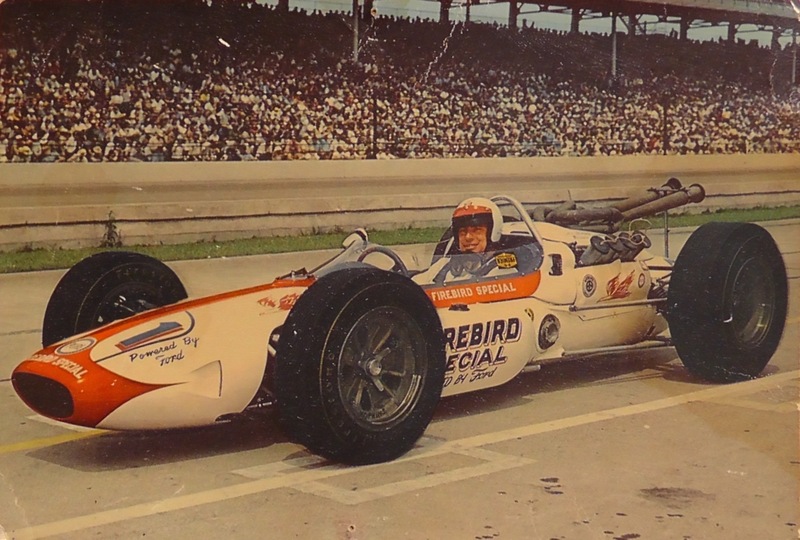 AJ Foyt in particular took umbrage. Expecting Firestone to be swamped, he approached Goodyear about using their stock car (NASCAR) tyres. They agreed. 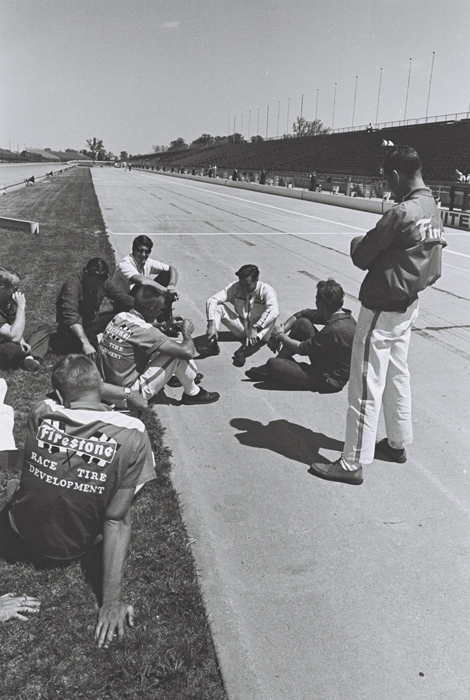 And, with that, the great Akron company began its single-seater racing history. The switch to Firestones had additional implications for Jim. 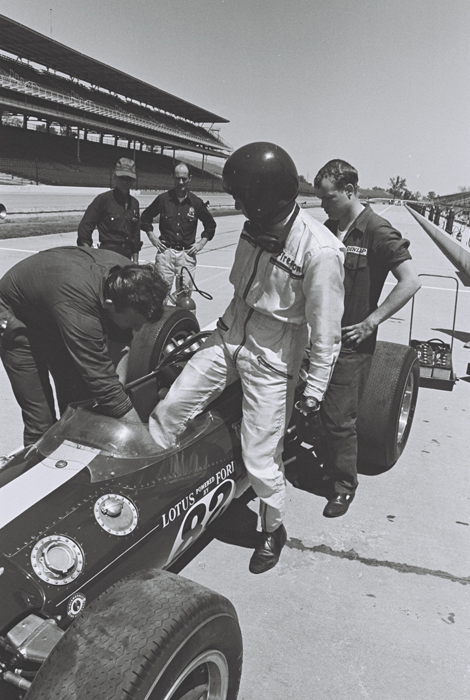 Until now, he had worn at Indy his regular, light blue, two-piece Dunlop overalls, complete with Esso and BRDC badges. 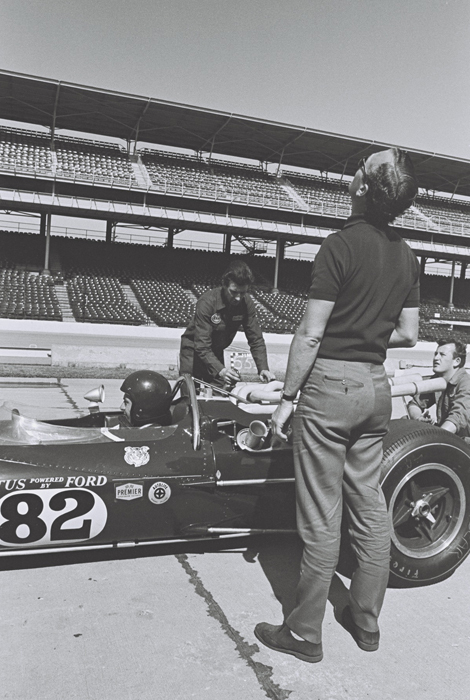 With Ford’s engine supply now requiring the Lotus 29s to use Pure fuel and lubricants, those overalls were obviously redundant. What to do? Dan introduced Jim to Lew Hinchman, the local owner of a large garment and uniform factory. 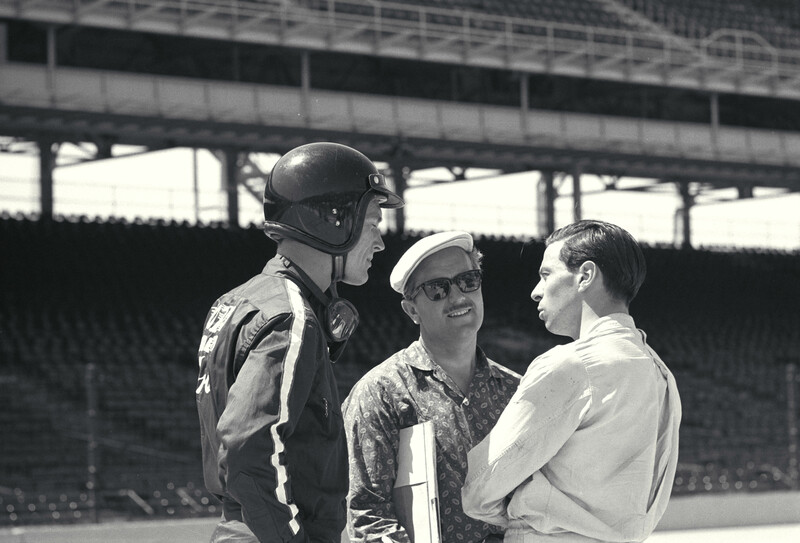 Lew, whose father, JB, built fire-retardant overalls for many of the American drivers, was in the process of making a dark blue, Ford-logo’d one-piece suit for Dan. Why not make one for Jim, too? 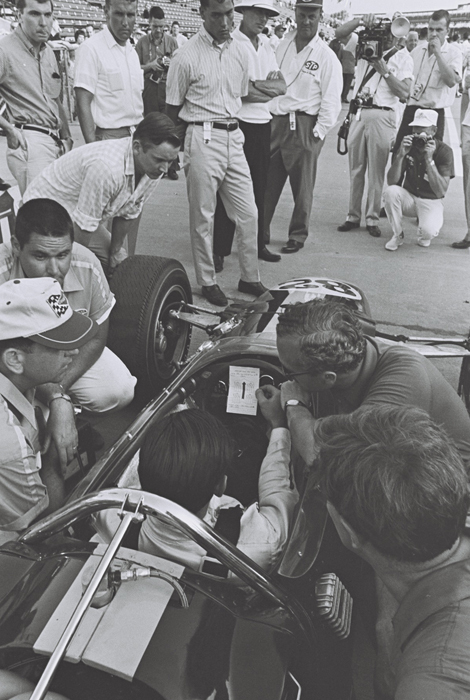 Jim was measured up in the sweaty Team Lotus garage one lunch break (air-conditioning units were forbidden by the Speedway Safety Police due to the WWII-spec wiring in the garages!) and Jim was told that the overalls would be ready for the first week of qualifying. Dan also pointed Jim in the direction of the Bell Helmets race rep. Dan had been using a leather-edged McHal for a couple of years, and loved it. Even so, he was impressed with the new Magnum. And so here was a chance for Jim to put his trusty Everoak out to pasture. Jim examined the new silver helmet and decided to try it in the build-up to qualifying. For Silverstone, next weekend, he would nonetheless race with the Everoak – for the last time, as it turned out. Tue, May 7: return to England (via Chicago). 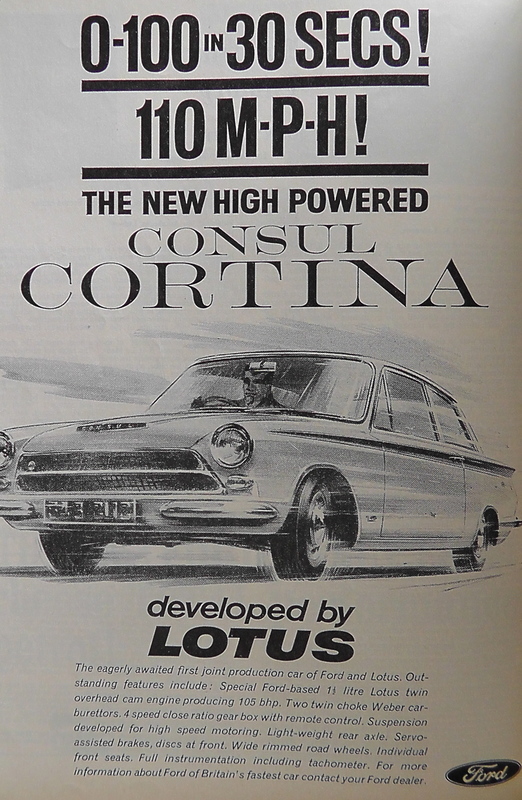 Pick up Lotus-Cortina at Heathrow. Drive to Silverstone. 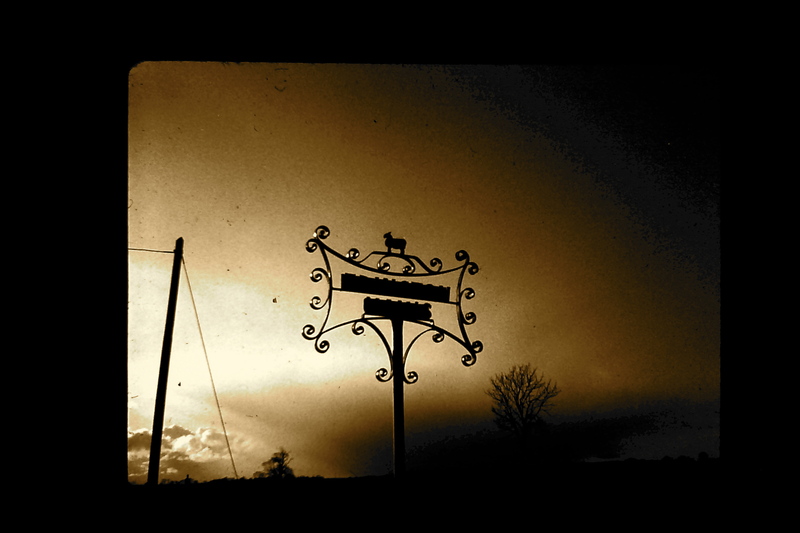 Check in to Green Man hotel. Thur-Fri-Sat: International Trophy F1 race, Silverstone. 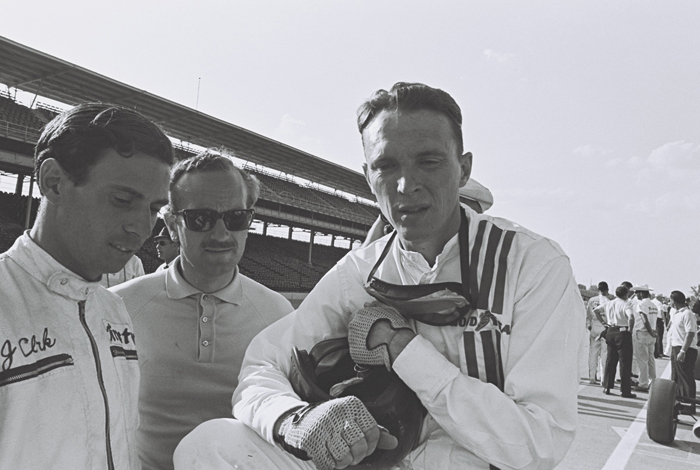 Sat, May 11: immediately after the race, fly with Colin and Dan Gurney to Heathrow in Colin’s Miles Messenger. Take flight to Chicago via New York. Change at Chicago for Indy. Check in to Speedway Motel. Begin testing Monday morning. Sat, May 18: Indy qualifying. Leave Sunday, May 19, for London. Stay with Sir John Whitmore in Belgravia. Two days at the factory at Cheshunt. Wed, May 22 : fly to Nice from Heathrow. Check in to La Bananerie at Eze sur Mer. Thur, May 23-Sun May 26: Monaco GP. Mon, May 27: leave at 4:00am for London. Take flight to Chicago and then on to Indy. Thur, May 30: Indy 500. Fri, May 31: fly to Toronto and then drive on to Mosport. 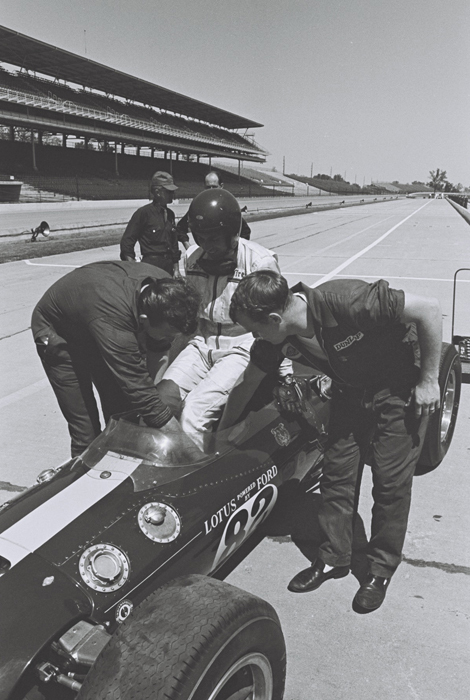 Sat, June 1: Players’ 200 sports car race (with Al Pease’s Lotus 23). Drive afterwards to Toronto. Take evening flight to London. 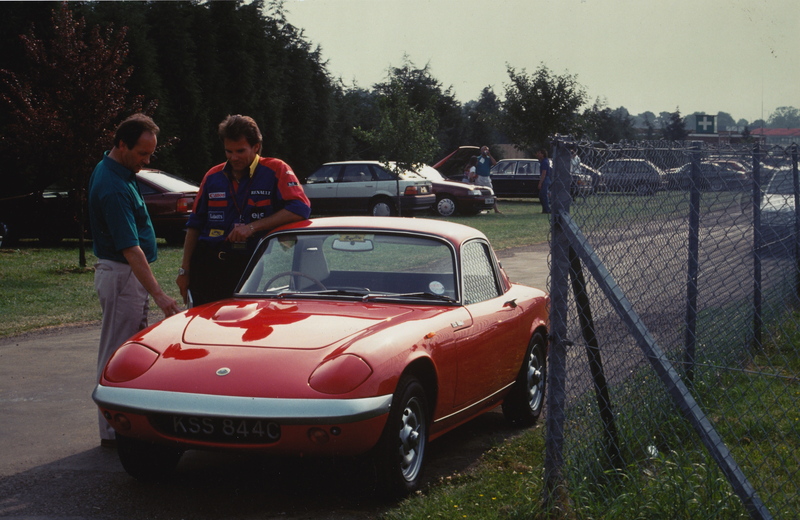 Mon, June 3: Whitmonday Crystal Palace sports car race (Normand Lotus 23B). Wed, June 5: Leave London with Colin for Spa (Belgian GP). In other words: phew! There was of course no internet back then; transatlantic phone calls were both a novelty and expensive. Communications with the UK were via telexes and telegrams. Flight bookings were handled by Andrew Ferguson’s office in Cheshunt but re-arranged in the US by David Phipps. And the tickets, of course, were big, carbon-copied wads of coupons. Jim’s black leather briefcase was literally jammed to the hilt. There was little time, though, as one Indy issue followed another, to wonder if it would all be feasible. If Jim didn’t qualify on the first weekend, for example – what would happen? Would he miss Monaco or would he foresake Indy? Given the powers behind the Indy effort – Ford, Firestone, etc – probably it would be Monaco. For now, though, it was heads-down: there was not a moment to spare – or even to think about the bigger problem. In the midst of all this, Silverstone turned out to be a golden Saturday to be forever savoured. Thursday and Friday, by contrast, were best forgotten. 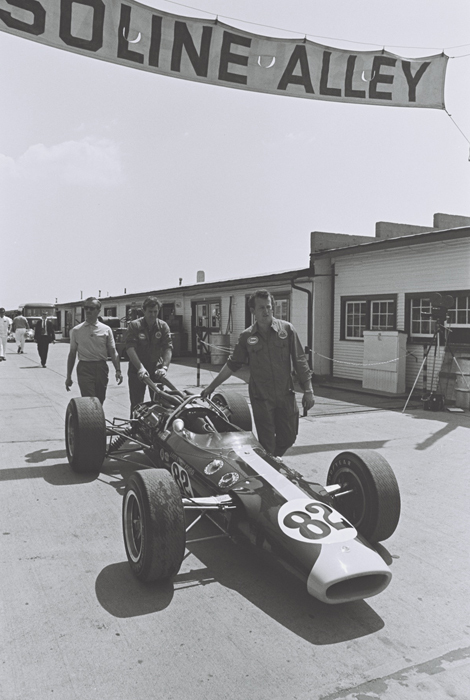 Dunlop were pushing R6 development to new frontiers; Jim, as at Snetterton, found the Lotus 25 to be all over the place on the new tyres. On a cold and windy Thursday, jet lag or no, he couldn’t find anything approaching a sweet spot with the car – and this was with exactly the chassis (R5) in which he’d been so quick at Aintree (on R5s). He was only fifth that Thursday, focusing as he was on trying to make the car work just through Stowe and Club. If he could find a balance there, he reasoned, then he could probably make up for deficiencies over the rest of the lap. To no avail. Saturday was cold and wet; as all-weather as the new Dunlops undoubtedly were, little could be learned about a dry-weather balance. The grid therefore being defined by Thursday’s times, Jim tried team-mate Trevor Taylor’s car for a few laps. A spin at Copse capped an unremarkable day. 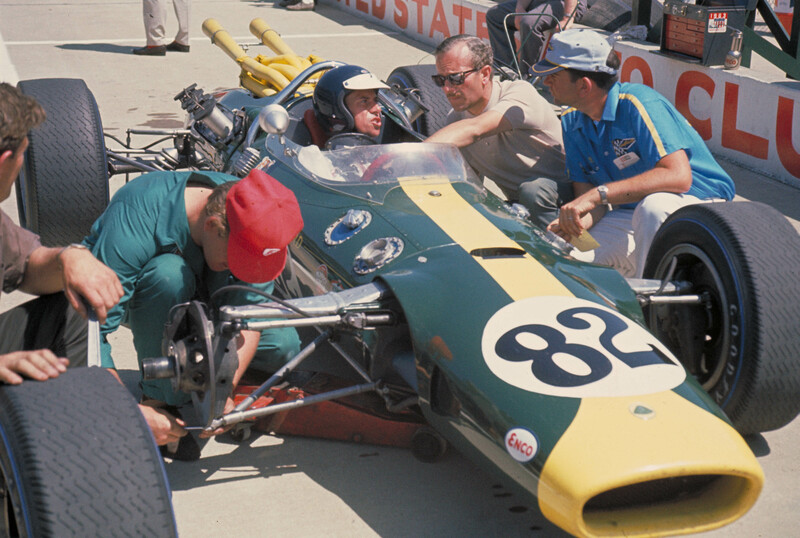 Innes Ireland, what’s more, would start from the pole in the BRP Lotus 24-BRM – a chassis that Jim had always liked. 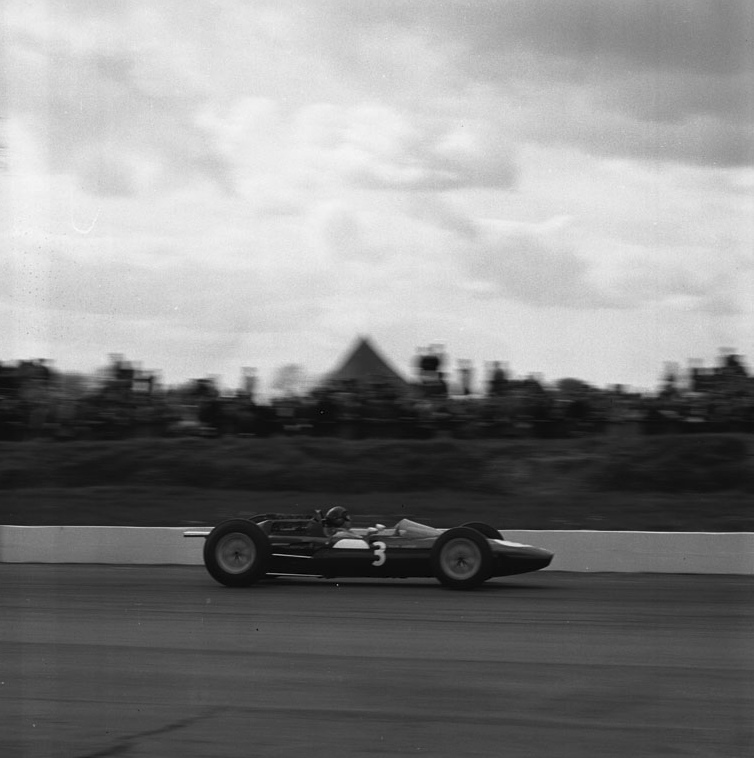 Graham Hill was second in his trusty 1961/62 BRM, Bruce McLaren third in the new works Cooper and Jack Brabham fourth in his BT3, his engine down on power after a rushed rebuild. 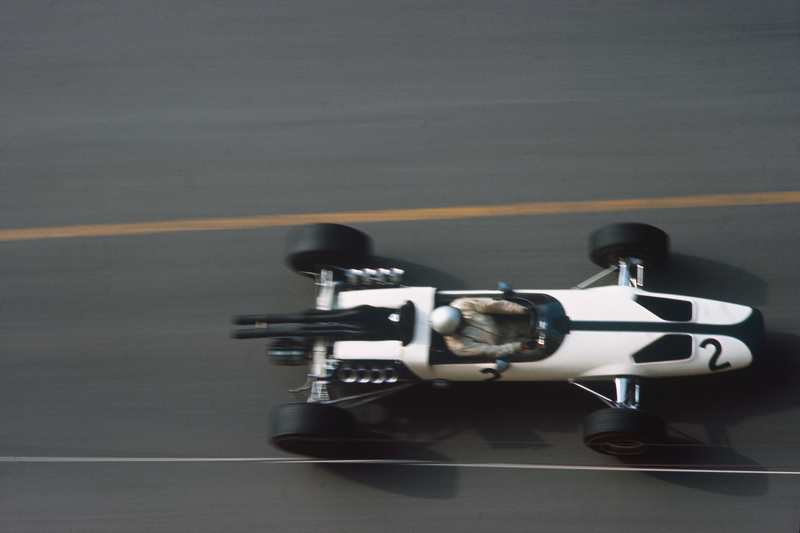 Poor Dan Gurney had flown over with Jim from Indy but for him there would be no F1 debut with Brabham: there was a dire shortage of Climax engines in this build up to the season proper, highlighted by Jack’s frequent runs up and down to Coventry. Jack was more than ready to let Dan race the one and only BT3 at Silverstone but a short test at Goodwood confirmed that Dan was much too tall for Jack’s cockpit. He would have to wait until Monaco to drive his tailor-made car. This they attempted. After packing the 25s back into the transporter and driving it to their regular garage on the outskirts of Towcester, they race-prepared the cars to standard spec before repairing to their hotel, the Brave Old Oak, in time for a half-past-nine drink at the bar. A “quick drink” then evolved into an all-nighter of a different kind – the liquid kind. Come Saturday morning, as the bleary-eyed Team Lotus crew hustled their transporter through the early-race traffic, all the talk was of the blonde girl who worked behind the bar…Princess Margaret and Lord Snowden attended the 1963 International Trophy; and the weather doffed its cap. A warm spring sun quickly replaced early cloud. 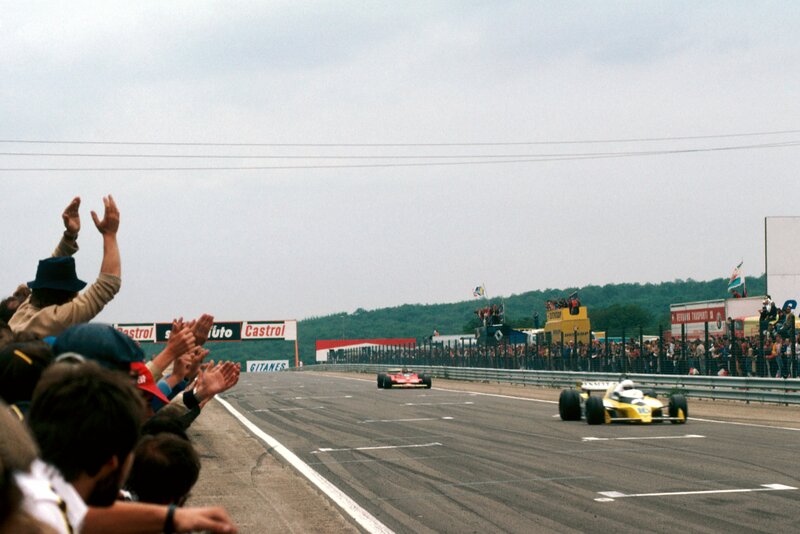 One hundred thousand spectators poured through Silverstone’s gates, filling the grandstands and the grass banks right around the circuit. The British Grand Prix may have been but a couple of months in the future – here, at Silverstone – but the fans could not get enough. A clear example of how less is definitely not more – providing the product is right. 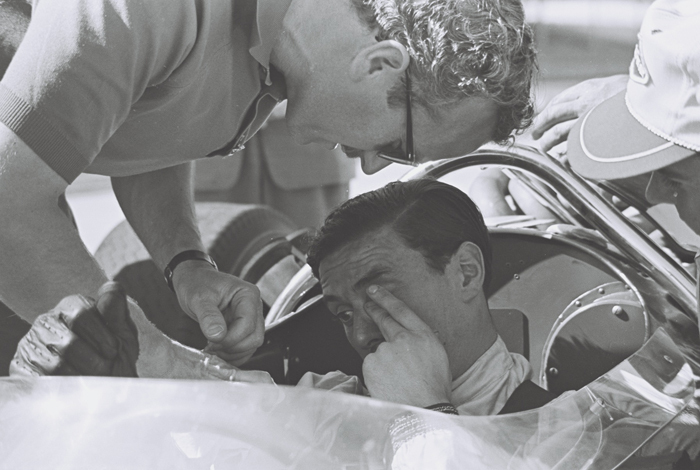 In the Team Lotus transporter, between laughs, Jim Clark reflected on the good news: today they would forget the R6s. They’d race R5s. Dunlop wouldn’t like it but there you go. A race is a race.A masterpiece of a race. Jim started on the second row but was quickly up to second place, trailing his friend Bruce McLaren for a couple of laps before slicing past and pulling away. Suddenly he had a Lotus 25 around him. Suddenly he had balance and feel when on Thursday he been obliged to drive mainly on reflex, dumbing the understeer with induced flick oversteer. 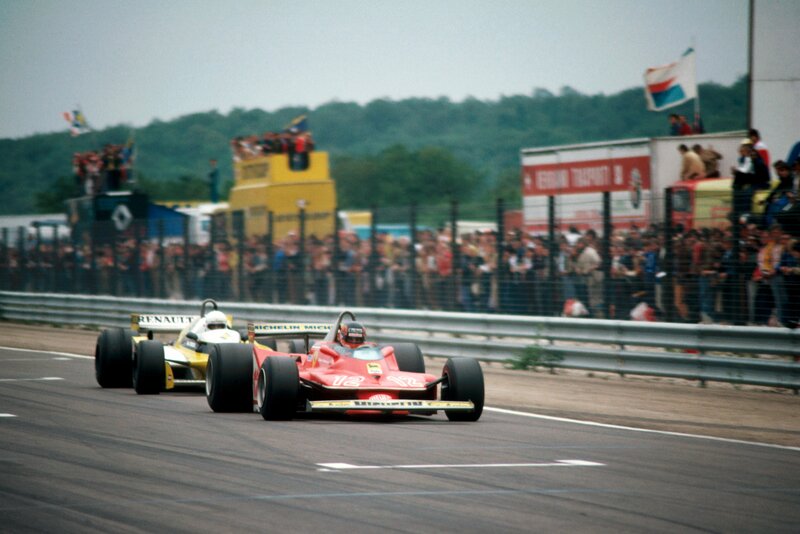 Now he was four-wheel-drifting the 25 through Copse, Becketts, Stowe and Club. Now he was using every inch of road through Woodcote and again past the pits, making the art of ten-tenths driving look sublimely simple. It was a fun day, too. 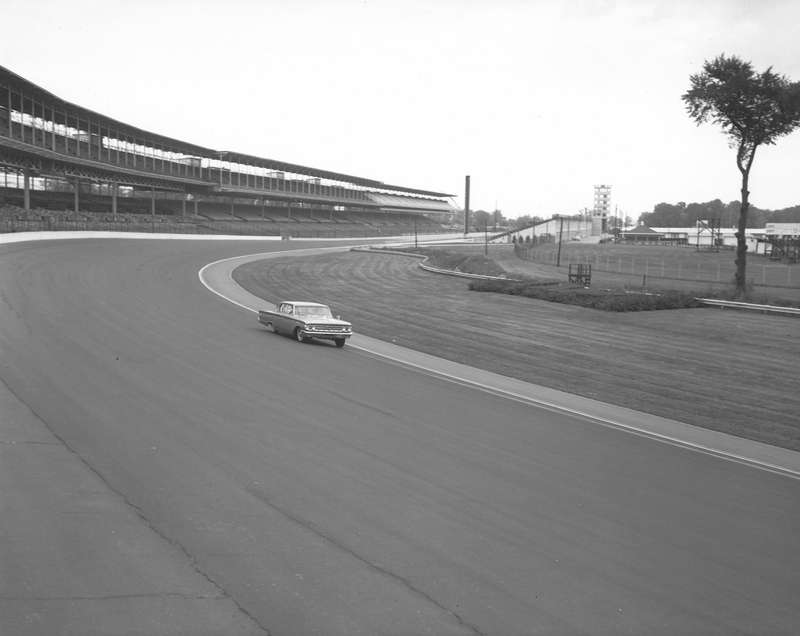 Sir John Whitmore was again magnificent in the Cooper S; Mike Beckwith won his class with the Normand Lotus 23B; Jack Sears scored the first of his many wins with the big Ford Galaxie – a car that Jim had driven over at Indy, when he was filling in some time one quiet day at the Speedway; Graham Hill won the GT race in John Coombs’ lightweight E-Type; and Denny Hulme again won the Formula Junior race in the factory Brabham, just beating David Hobbs and Paul Hawkins. Earlier that week, Jack himself had driven the FJ car, helping Denny with set-up and with a few circuit pointers. Then there was the business with the Miles Messenger. 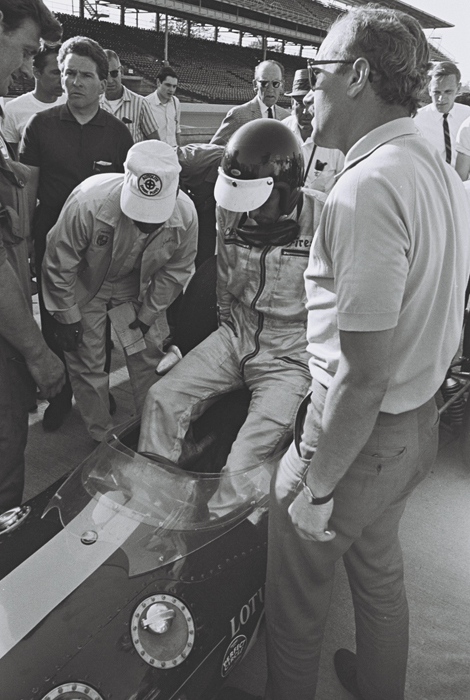 Racing over, Jim and Dan piled into the cramped four-seat cockpit; bags were stuffed into the small luggage compartment (no room for the trophy! ); Colin fired up the DeHaviland Gipsy engine, opened the throttle…and nothing happened. The old four-seater remained bogged in the Stowe mud, its wheels intransigent. Out jumped an amused Silverstone winner and his buddy, Dan – and off, in a lighter Miles, set Colin. Even as the little aeroplane was gathering speed, Jim and Dan were scambling aboard. 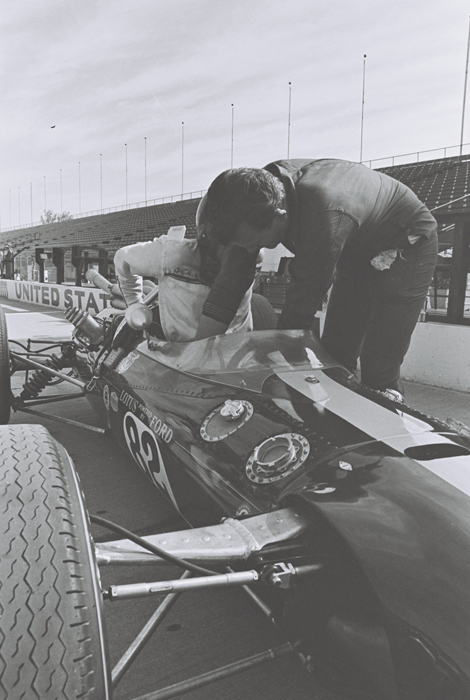 Four connections and 4,000 miles later, the two Team Lotus friends were at Indy, ready to test on a warm Monday morning. 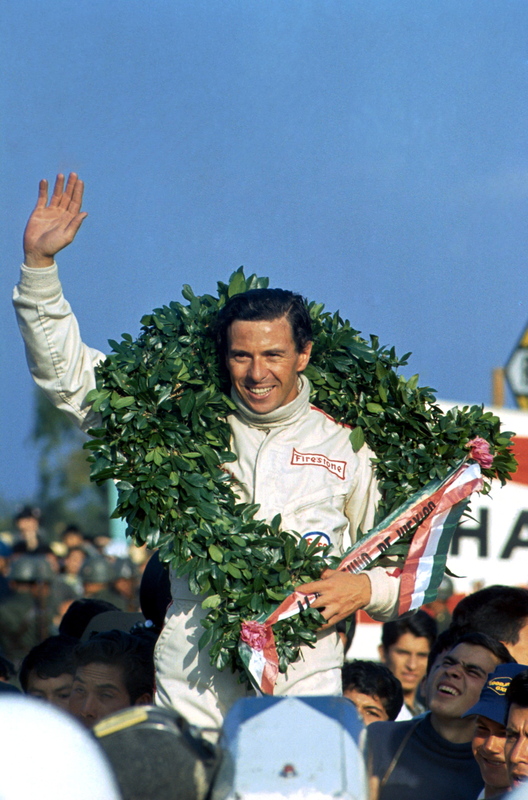 Jim Clark was a guest on Roy Plumley’s “Desert Island Discs” BBC radio programme on May 4, 1964. For reasons only known to the BBC it is not possible today to replay the interview but here is the list of eight that Jim chose to play. The item he selected for company on his desert island? 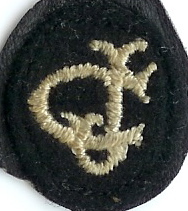 A radio. The book he would take with him? 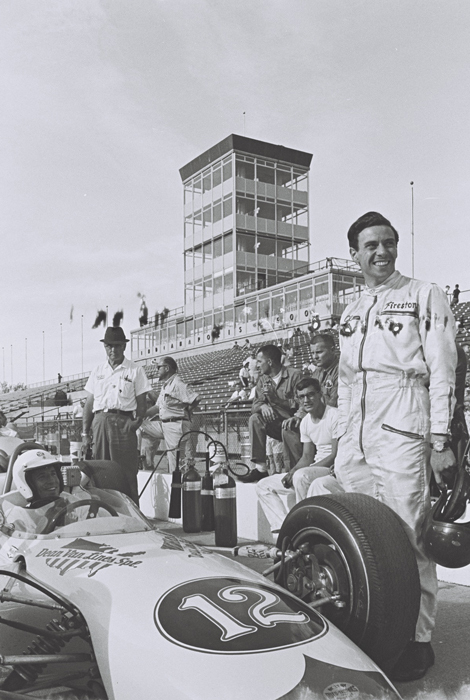 Jim Clark at the Wheel (of course!). It had, after all, just hit the book stores…. I can imagine Jim doubling up with laughter whilst listening to Gerard Hoffnung (http://www.youtube.com/watch?v=OOGfg1B3ZMw). And I’m sure that Sheep May Safely Graze gave him reassurance that all was well at Edington Mains. Equally, there is a certain poignancy about his choice of Peggy Lee’s The Party’s Over (http://www.youtube.com/watch?v=-IZk7jP0LkM). It gives a very ’60s taste of the morning after the day before – and perhaps of a future that all racing drivers of the era inevitably had to address. Note also that he chose Chris Barber’s Jazz Band. Chris still performs today (most recently at the Silverstone Classic meet) and played live at Brands Hatch (at the British and European Grand Prix) a few weeks after Jim recorded the BBC interview with Plumley. Jim won that race, of course.